3 Gemstone marbles (Hematite and Dalmatian stone) and Fluorescent Vaseline glass marbles (clear); info on "Civil War marbles"
IF YOU ARE LOOKING FOR REPLACEMENT MARBLES FOR THE SOLITAIRE GAME, YOU NEED "30 MM MARBLES", TYPE THAT IN THE SEARCH ENGINE TO FIND SELLERS FOR THAT SIZE. #L-122. JUMBO vaseline glass marbles (1" diameter) (note under regular store lighting, and under black light! They are fakes. 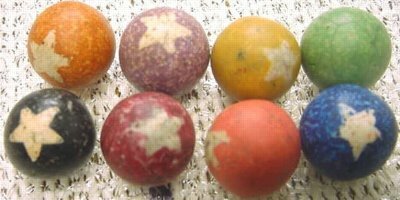 They are new clay marbles painted to look old, or old grayish clay marbles dug from a site, then painted over with common latex paint with a star on each one. The history that is claimed: They were recovered from a factory that made porcelain and clay marbles between 1840-50 in Atlanta Georgia. The original site burned in 1864 during the Fall of Atlanta at the hands of William Tecumseh Sherman. Fragments of these marbles have been found at the Gettysburg Battlefield where they were broken during the firing of the canister rounds. Bulldozer operator James W. Kirkland of Harriman TN found the stash of 5,000 or so 19th century marbles. He was a subcontractor for a construction company that flattened the dilapidated buildings in a 72 acre area that became Atlanta's Centennial Olympic Park (excerpt from Atlanta Journal Constitution "Window to the Past" by Bill Hendricks, dated 3/23/97). There were no companies mass producing clay marbles during that era, only glass cane cut swirls imported by the barrel-load. The story sounded so plausible that many folks bought them. Now they are so famous, people collect them as an example of FRAUDULENT MARBLES, their notoriety has made them collectible.